... JJ overshadows JAM ... many people still remain desperately poor ACCRA, 26 Nov 2004 (IRIN) - With less than two weeks to go before Ghanaians head to the ballot box, President John Kufuor is on course to win a second term as the opposition candidate struggles to emerge as his own man, analysts said on Friday. Kufuor, of the ruling New Patriotic Party (NPP), will face his main rival John Atta Mills of the National Democratic Congress (NDC) and other minor candidates on 7 December. If no-one wins more than 50 percent of the vote, there will be a run-off but most commentators think that unlikely. "He really has to do something very foolish or outrageous to lose. The election is his for the taking and my surveys indicate there will be only one round of polling," said Ben Ephson, the editor of the privately-owned Dispatch newspaper, who has accurately predicted the last two elections. Kwesi Jonah, a senior researcher at the Accra-based Institute of Economic Affairs, agreed. "If everything goes well, the incumbent will be able to obtain 55 percent of the vote," he told IRIN by phone. Weighing against the opposition candidate are two crucial factors, analysts say. Firstly Kufuor soundly beat Atta Mills in the last presidential election in 2000, and perhaps more importantly, Atta Mills has failed to emerge from the shadow of former NDC leader Jerry Rawlings, who dominated political life in Ghana for a generation. A former air force officer known as "Junior Jesus" by his followers, Rawlings first came to power in a 1979 coup. He then ruled Ghana as head of state for most of the next 20 years. He is a flamboyant and colourful character, in contrast to Atta Mills' restrained intellectual style. But a commission set up by Kufuor to investigate human rights abuses committed by successive military governments in Ghana has focused strongly on wrongdoing committed during Rawlings' era. Rawlings served two successive terms as elected president in the 1990s, with Atta Mills, a former law professor, joining him as vice-president for the second term. Rawlings then had to stand aside under the terms of the constitution, leaving Atta Mills to seek election. Hogging the limelight Nonetheless, the former President has continued to be a prime fixture in this year's election campaign, embarking on extensive tours of the country to shore up support for his protégé. But many commentators think he is doing more harm to the NDC cause than good. "People are fed up with Rawlings. They want someone untainted by his legacy," Jonah from the Institute of Economic Affairs said. Kwami Boafo-Arthur, head of the political science department at the University of Ghana, said Rawlings' high profile was making Atta Mills look weak and this would reduce support for him among undecided voters. "Rawlings is going about on the campaign trail talking complete rubbish. He's completely overshadowing Atta Mills and it's turning people off the NDC," the professor told IRIN. "People are asking can this man really be his own person? There's a worry that Atta Mills is Rawlings' puppet and a vote for him is a vote for Rawlings." For example, Rawlings has accused Kufuor of being a thief and has demanded his arrest. And last weekend newspaper front pages and radio talk shows were full of an alleged assault by Rawlings on a NPP official in the north east of the country. This left Atta Mills, his presidential candidate, competing for attention. The two other main parties contesting the presidential election, the Convention People's Party (CPP) and the Grand Coalition, are widely viewed as bit-players. "I will be very surprised should the CPP and the Grand Coalition get more than four and five percent respectively of the total votes cast," said newspaper editor Ephson. "And they are too fragmented to cause any major upset should they decide to back either of the main parties." Although political analysts say the path looks clear for Kufuor, a 65-year-old Oxford-trained lawyer, to serve a second term, they warn that Ghanaians will not give him a flawless scorecard for his first four years in office. Strong world prices for cocoa and gold, two of Ghana's main exports, have helped push economic growth up to over five percent a year and under Kufuor's leadership the country qualified for substantial debt relief from the World Bank and major western donors. This enabled his government to reduce its debt service payments by US$ 320 million a year. But many people in this county of 19 million remain desperately poor. Nearly 45 percent live below the official UN poverty line of less than a dollar a day, and average per capita income is just US$ 304 a year. Many poor rural families are still reduced to selling their children to people traffickers to make ends meet and planeloads of Ghanaian migrants are regularly sent back from Libya after failing in their bid to make the clandestine Mediterranean crossing to a better life in Europe. A nationwide survey of voter attitudes in August, published by the National Commission for Civic Education, showed Ghanaians wanted their politicians to focus above all on improving education. Their other top priorities were healthcare, unemployment and agriculture. Stellar reputation Still, despite these grievances, Ghana's current-day reputation as a tolerant and genuine democracy, has won Kufuor many plaudits. "Even though Ghanaians think that the performance of the economy and the improvement in their own standard of living has not been that impressive under Kufuor, they are happy that the basic freedoms have been restored," said Boafo-Arthur from the University of Ghana. "Freedom of speech, freedom of association, freedom from arbitrary arrest." During 18 months of hearings which wrapped up in July, Ghana's National Reconciliation Commission (NRC) heard witnesses from all walks of life tell of executions and torture, of loved ones disappearing and property being seized, of workers being arbitrarily dismissed from jobs and bosses being fined for being too rich. "I just want this politicking to be over with so we can get on with our lives. I am not for NPP or NDC. I am just tired of politicians sprouting promises every four years when they know they need our votes," 42- year old Kwamena Poku, a taxi driver in Accra, told IRIN. "Life is not easy, my brother," he added. "My earnings have not increased significantly over the past years but my utility bills, kids' school fees, hospital bills, rent, and car taxes have shot up. And they say petrol prices will go up again next year. God save us." As election banners and flags of the four main parties appear like a rash, on trees, lampposts and electricity pillars around the West African country, some predict that this year's elections, the fourth multi-party polls to be held since the end of military rule, will prove to be the calm between the storms of 2000 and 2008. In 2000, a great wave of excitement swept the country with Rawlings no longer on the ballot paper, and the scent of change in the air. 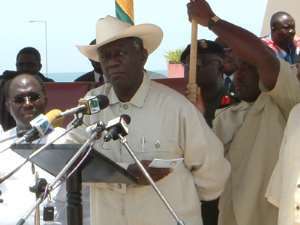 Some expect to see the same enthusiasm reappear in four years time, when Kufuor will no longer be eligible to stand. "Election 2008 will be more exciting and the stakes will be higher. Kufuor will not be able to stand again and the NPP is bound to have more problems on its hands," Ephson, the newspaper editor and election watcher told IRIN. "Should Mills lose out in 2004, there will be a struggle within the NDC to cut out the Rawlings influence. New parameters will then be set out for Ghana's politics."